Aether Lashes are a brand still in their infancy, having only been established a few years ago, but their mantra has remained consistent. They are a firm believer that there is no ethical way to create mink hair products and much of their focus is educating consumers on this practice and why it shouldn’t be encouraged. They are so passionate about the cause that a percentage of every product sold is donated to support all fur-bearing animals, including minks. Instead, they believe synthetics are the future and have developed two synthetic ranges that are both cruelty-free and premium quality. 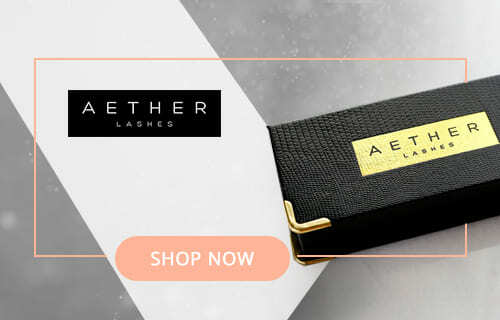 To keep up-to-date with Aether Lashes and their new products, they also provide an optional newsletter for those of us with very busy lives. For a new company Aether Lashes has certainly made a splash in the eyelash market, but where can you buy a pair? Aether Lashes is an American company made very accessible globally. If you purchase items off their own website, they provide a flat rate for shipping charges, which means if you are based in the US the shipping charge is just $3.99, and for international customers, shipping is $6.99. However, if you consider yourself to be an eyelash connoisseur and want to buy multiple pairs, then you can receive free shipping if you spend over $35. Some of their bestselling eyelashes can also be bought on another trusted site, amazon.com. Currently, only three of their styles are stocked; Belladonna, Delphine, and Freya. These styles are all priced at $17.99 which when compared to their own website, is an average price. As a company that has become very successful very quickly, it’s a great sign that large companies such as Amazon are supporting their brand. As said above, Aether has two ranges of eyelashes, their Signature Luxe Lashes and the Premium Natural Lashes. Let’s break down each range and find out what styles they offer. What Are Signature Luxe Lashes? This range comes in 9 different styles and aims to give customers a fuller and thicker look. Aether wanted this range to feel as light as possible when worn, so they chose to make them with ultra-thin synthetic fibers, which have been individually positioned on the band. This range has amazing durability, and if taken care of can be re-worn up to 30 times. This explains the price tag, which falls at $28 per pair of eyelashes. Even though it’s not the cheapest range, it could last you the longest! One of the categories’ most interesting styles is Rebel Rebel. Aether’s eyelashes Rebel Rebel does exactly what it says on the tin, it breaks all the rules. It has a very unusual lash layout which creates a stand-out look. What Are Premium Natural Lashes? This range, like the name says, is a natural collection and is again, made with synthetic fibers. These are ideal for customers who want a very authentic life-like style but don’t want to spend too much in the process. There are only 4 different styles to choose from; Magnolia, Belladonna, Delphine, and Freya. Each pair can last up to 15 wears and because of this, they are slightly cheaper than the Luxe range. Magnolia is priced at $14, while the latter three are $13. Belladonna is one of the bestselling styles in this range and is featured most commonly on their Instagram page. One of the few negatives of Aether Lashes is their lack of eyelash products on their website. It would be nice to see either some eyelash glues or an applicator for customers who are not as familiar with wearing fake lashes. They do provide an online lash guide, which they are currently developing so maybe other products are in the pipe line. Another issue is that some of their Amazon links were not working, for instance, styles such as Wildchild and Moonprincess couldn’t be found anywhere. Presumably, this is because they have run out of stock, but it would be nice for them to take down the link to avoid confusion. For the time being, they don’t have a massive range of fake eyelashes, but this isn’t surprising considering how young the brand is. How Do We Rate Aether Eyelashes? This brand is incredibly transparent with its reviews – of which there are many positive. They have a well designed and clear website, as well as already selling a lot on Amazon. Customers clearly feel very comfortable navigating the products and quite readily post photos of how the eyelashes look on them. This gives new customers a lot of confidence in the brand. I would say this is a very affordable brand of fake eyelashes. Their lower priced range begins at $13, while their most expensive is $28 – which is a fair price considering the number of times they can be worn. Judging from the reviews and how passionate Aether is about creating a luxury synthetic range – we would consider them to be of high quality. They have been praised not only for how soft each pair is but how light as well – with many claiming it doesn’t feel like they are wearing any falsies at all. 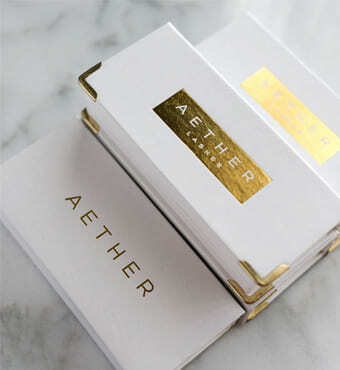 Aether also provides beautiful and high-quality packaging for all their products – its great to see a company investing so much time developing the aesthetics of the brand. Aether definitely lacks variety compared to some of the larger eyelash brands, but they are still developing new styles and hopefully, in the future, we will see more variation. They deserve high praise in this category. Their Luxe range can be worn up to 30 times – which makes them a great investment for all the eyelash fanatics out there. Aether Lashes are a great brand whether you are attracted to the quality of their synthetics or love their stance on animal cruelty. This brand is the perfect combination for beauty lovers and ethical eyelash advocates. If you like the sound of Aether Lashes, you can now get 10% off your order just by using the code minkfree.